Booming megacities and digitization, but also climate change and environmental concerns are changing the world. Especially IT companies are hyped in the media. However, it is less known that manufacturers of plastic pipes, for example, also benefit from the change. Whether it is the protection of newly laid communications infrastructure, reliable and hygienic waste water disposal and potable water supply or more efficient irrigation for agriculture: PE pipes can meet the rising requirements and are increasingly in demand. Market researchers at Ceresana have already examined the global plastic pipes market several times. For the first time, the research team is now presenting a separate market study and forecast for polyethylene pipes: The global demand for PE pipes is likely to increase by 4.3% p.a. until 2025. Polyethylene potable water pipes are highly resistant to inorganic acids, salt solutions, and alkaline solutions. Additionally, they are temperature-resistant. In contrast to metal pipes, PE pipes are suitable for all water qualities: They are not susceptible to corrosion and do not release metal ions into drinking water. The legal requirements for potable water pipelines are often very high. Especially in developed industrial countries, PE pipes and PE multilayer pipes in the potable water segment are therefore gaining market shares from PVC pipes, for example for house connection pipes. For floor distribution, pipes made of cross-linked polyethylene (PE-X) or polybutene (PB) are now often used. Risers and cellar distribution pipes are typical application areas for composite pipes made of PE-X and aluminum. In the segment cable protection, PE pipes can also often gain market shares at the expense of PVC. Particularly in the case of broadband expansion and the laying of new fiber optic cables, more PE pipes are likely to be used than PVC pipes. A distinction has to be made between various pipe types such as fiber optic protective pipes, microtubes, or cable conduits. In the segment cable protection, global demand for PE pipes is expected to increase by around 4.8% p.a. by 2025. Non-conventional installation techniques in particular make use of specialty piping materials, such as PE-100-RC that is resistant to cracks or PE pipes with increased temperature resistance (PE-RT). In pressure pipes, cross-linked polyethylene (PE-X) is increasingly replacing steel and copper. PE-X is suitable for a very large temperature range (- 40°C to +60°C). Thus, this material is used for hot and cold water pipes, heating and cooling applications as well as thermal activation in particular. Further application areas are car manufacturing, gas and oil pipelines, as well as industrial pipelines, for example for the transport of chemicals. Distinction is made between cross-linking processes that utilize peroxides (PE-Xa), silanes (PE-Xb), and radiation (PE-Xc). Cross-linking increases temperature resistance and stability compared to standard-PE. The fact that polyethylene is flexible and can be welded as well as processed into coiled pipes is particularly important for the manufacturing of pipes For heating and cooling applications, PE-X and PE-RT as well as multilayer composite pipes are used. PE pipes are increasingly replacing pipes made of steel or stoneware, and in some segments also pipes made of other plastics. However, this trend is being overshadowed by current economic developments: Political uncertainties, decreasing public expenditure, or missing private investments can have similarly drastic effects on the construction industry and the pipe market as targeted support for single construction segments. The investments in the segment irrigation or the expansion of the fiber optic network vary from country to country. Currently, the outlook for the important markets in China and Russia, for example, has brightened again. Chapters 2.1.1 to 2.5.5 examine the influential factors of these complex markets for each country. 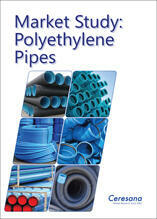 Chapter 1 provides an overview and analysis of the global market for PE pipes – includ-ing forecasts up to 2025: Revenues (in dollars and euros) generated with PE pipes and production of and demand (in tonnes) for polyethylene pipes are given for each region. Chapter 2 examines the 16 major countries in more detail: Revenue, import, export, and production figures of PE pipes. In addition, the distribution of domestic demand among the important application areas is analyzed for each country. Chapter 4 provides company profiles of the largest manufacturers of plastic pipes – clearly arranged according to contact details, revenues, profit, product range, production sites, and profile summary. In-depth profiles of 75 PE pipe manufacturers are given, including Aalberts Industries N.V., Aliaxis Group S.A., China Lesso Group Holdings Ltd., Fletcher Building Ltd., Geberit AG, Georg Fischer AG, Mexichem, S.A.B. de C.V., Rehau AG + Co, Sekisui Chemical Co., Ltd., and Westlake Chemical Corporation.